Posted byJoelRieves	 July 6, 2015 Leave a comment on Well played, Arkansas. Well played. This past weekend, the League of the South’s Arkansas chapter celebrated America’s birthday with a rally in support of “traditional marriage” and, get this, the Confederate flag. I’ll pause here for a minute to the deliciousness of that irony sink in…, is that not awesome? Of course, it’s easy for me to revel in this amazing display of cognitive dissonance since it’s in Arkansas and not North Carolina. I suspect Jena Barber, the friend I must credit for bringing this morsel to my attention, doesn’t share my enthusiasm. Now that you’ve stopped laughing at the sheer insanity of the event, you may be wondering, “Who the hell is the League of the South?” Oh, I’m so glad you asked (even if you didn’t). The League of the South is a crazy, whacked out group of secessionists who just happen to have their own private army. Oh, and they’ve been designated a Neo-Confederate hate group by the Southern Poverty Law Center. Of course, they don’t describe themselves that way; according to their website, they are “a Southern Nationalist organization whose ultimate goal is a free and independent Southern republic.” Right, because we haven’t lost that war already. The historical amnesia _ Robert Miller, Arkansas’ Chair of the League of the South, said “the Confederate flag has about as much to do with racism as a Krispy Kreme donut has to do with representing police“. Okay, that’s not really what he said; that quote comes from a blog about Nickelodeon cancelling “The Dukes of Hazzard”. Miller actually made some rambling statement about racism being “irrelevant” and a tool “to silence the enemies of the left”. But, the sentiment is basically the same. Was the flag in question flown by the army of a country who justified owning black folks by counting them as less than human? Sure. And then, 100 years later, was it used as a symbol of defiance against the federal government as they enforced laws granting those black folks equal rights. Absolutely. But, that’s not racism, it’s our heritage. It’s a Confederate flag rally…, on the 4th of July _ Yes, this was a rally to support the flag of an enemy on the day that celebrates the birth of United States. And, not only that, the rally was staged by a group that wants to leave this country. Why, that makes perfect sense. “Traditional Christian Marriage” _ Up until this point, I’ve mostly been talking about the flag, but there’s no way I could let this slide by. “Traditional Christian Marriage”, huh? Right, because marriage hasn’t changed one little bit over the years: marriages are arranged by families, women are basically chattel and are betrothed at ages as young as 12, divorce is the sole province of men, etc. Just so you know, I didn’t go back to the first century for those ideas; that’s the way marriage was in the United States as recently as the 1800’s. Cultural Genocide _ Yes, removing a symbol that is offensive to 30% of a state’s population from the grounds of a building that’s supposed to represent those people is “cultural genocide”. Just like the recognition that other people have the same rights that you’ve enjoyed for years violates your religious liberty. Freedom _ “Unless we are removed from them, unless we are free, unless we secede from the Union, we will never see a free south again.” Said by a man who is the state chairman of a group advocating an illegal act, while waving an enemy flag. And, didn’t get arrested for doing so. I have to admit I’m a little jealous, though. I mean, North Carolina’s entry in this round of the “Race to Crazy” sweepstakes is sending a Klan group to Columbia SC to protest the discussion of another state to remove the flag from their capitol grounds. 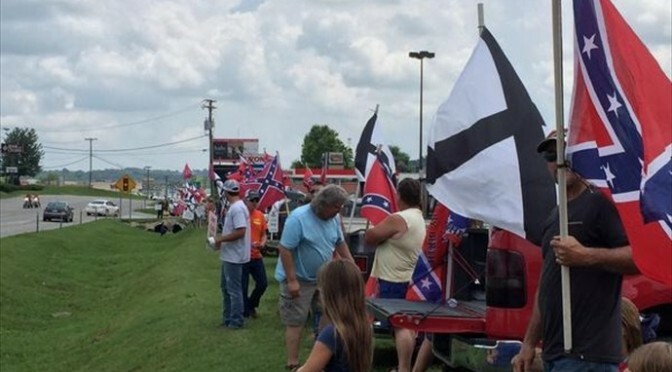 While that is some Grade A racism, it’s nowhere near as imaginative as a 4th of July rally in support of the Confederate battle flag and “traditional” marriage. Well played, Arkansas. Well played.